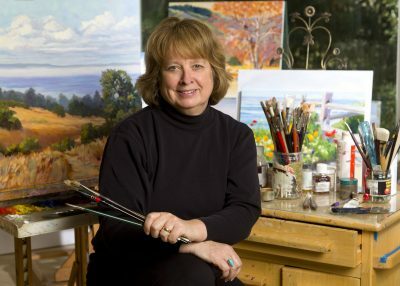 Michele is available for private and semi-private painting instruction. Contact Michele to arrange a session. She provides guidance in painting and constructive critical feedback on your work. Two 3-day workshops are planned for early in 2019. Foci will include “Value and Composition” and “Color and Atmospheric perspective.” See below for more information. Dates: Saturday, Sunday, Monday, January 19 – 21, 9:30 – 3:30. In this January workshop, we will focus on painting landscapes, with an emphasis on composition and value. Learning to see is one of the primary skills an artist develops over time. Participants will work on grouping masses into major values. Value is the light and dark tones that exist because of light. You will make gray scale sketches of several images to develop your skill at seeing value. Michele will also address the various light sources found in nature and how these change the temperature of objects. Learning how to interpret this light in paint is also a skill we will work on in the workshop. 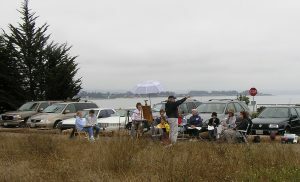 We will meet each morning at my Soquel studio, where the workshop will be held. You will need all your painting supplies on the first day – including easel, paints, brushes, cleanup supplies, etc. A full materials list will be sent as soon as you are registered. You will be given access to my Scholar Pages once you register. These include various class notes and reference materials prepared for my students. Note: Artists will work with their own reference material or may choose from images provided by me. Please do not print copyrighted images from the internet. I am offering private landscape painting sessions by appointment. These offer more flexibility and personalized attention than could be afforded with group classes. Sessions are roughly 3 hours in duration. Instruction is set up to meet your individual needs – the great benefit of a private lesson. 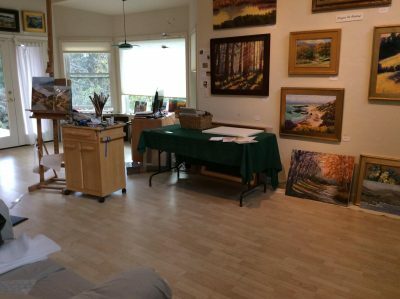 I will work alongside you, demonstrating various steps and guiding you with instruction regarding value, color, shape, line, texture, and edges as they relate what we are painting. 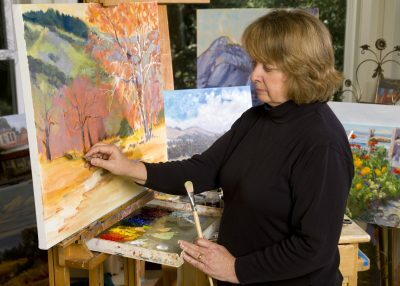 If in studio, you may choose to work from your own reference material, photos and / or plein air sketches. Or I can provide such. Once you are registered on line, I will contact you to arrange a date and time, and to make a basic plan for what type private class session will work well for you. A suggested materials list will also be sent to you after you register. Dates: Saturday and Sunday this summer at the Santa Cruz Art League. Exact dates to be set soon. 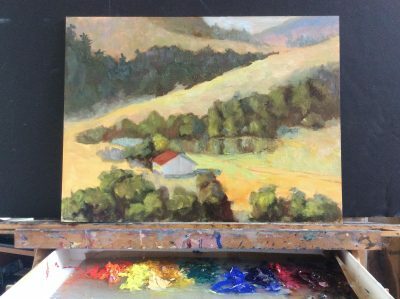 This workshop will focus on the use of color to create a harmonious painting and use of atmospheric perspective to create depth in your painting. We will meet each morning at the classroom beside the Santa Cruz Art League’s art Gallery, where the workshop will be held. You will need all your painting supplies on the first day – including easel, paints, brushes, cleanup supplies, etc. A full materials list will be sent as soon as you are registered.